HAZMAT packaging refers to the packaging of hazardous materials that are capable of posing risk to health, safety, or property when transported in commerce. HAZMAT packaging has emerged as an efficient way to protect environment from hazardous chemicals. Incidents involving HAZMAT packaging product types can involve risk of contamination, leakage, spillage fire, and explosions, which can threaten individual health and cause the breakdown or failure of equipment or processes and the performance of facilities below expected levels of capacity. So, HAZMAT packaging plays an important role in the shipment of hazardous goods. The basic shipment description required for HAZMAT packaging consists of shipping name, hazardous material classification, identification number, and the respective packing group. Labelling & marking are the two primary constituents that play a vital role in the HAZMAT packaging market. The scope of this report is the primary packaging of HAZMAT goods. Primary HAZMAT packaging includes packaging of products through drums, flexitanks, industrial bulk containers, etc. Packaging done with corrugated boxes is a part of secondary HAZMAT packaging. 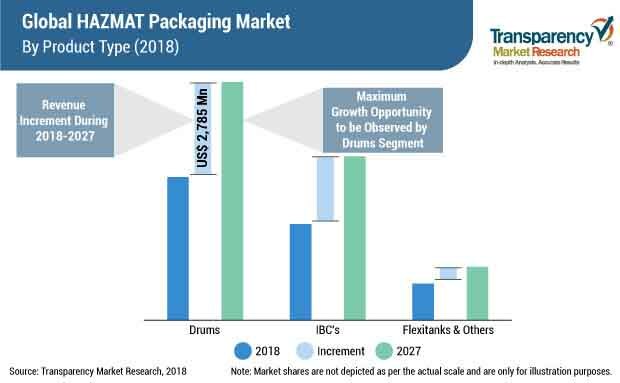 In the report, TMR suggests that developing countries such as India & China, are estimated to register impressive growth in the HAZMAT packaging market during the forecast period. The growth is supported by the rising concerns towards the safety of goods and the growing chemical & refinery industry. Moreover, increasing production of drums in China is driving the demand for HAZMAT packaging. Research also suggests that Europe is estimated to have promising potential in the development of the HAZMAT packaging market. Also, stringent regulations imposed by the government regarding the transportation of HAZMAT goods are driving the demand for HAZMAT packaging. Global manufacturers in the HAZMAT packaging market are opting for U.S. /DOT, IMO approved products as the fine imposed, if rules are not followed is quite high. Also, key players are expanding their production capabilities in order to outpace their competitors in the market. For instance, Hoover Ferguson Group has expanded its production capabilities and provides the highest quality standards in HAZMAT packaging as its products are DNV, BV, UN, and IMO certified.